The arch is a wonderfully elegant way to build a roof. Below are a few examples of my efforts. 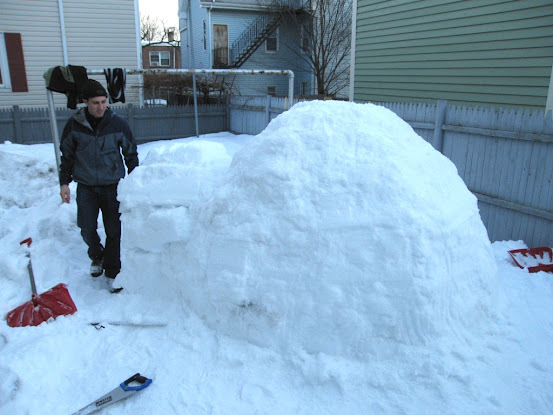 In the winter of 2011 in Boston, my friend Eric had enough snow in his backyard to build an igloo ... so we did just that. 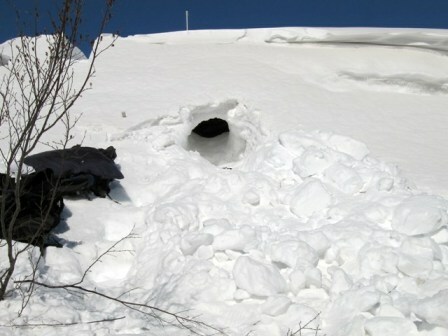 Here he is removing a block from the "quarry"
There is the finished igloo. Some water had frozen in the bottom of a bucket - so we made an ice window. See the rest of the pictures from that winter here. 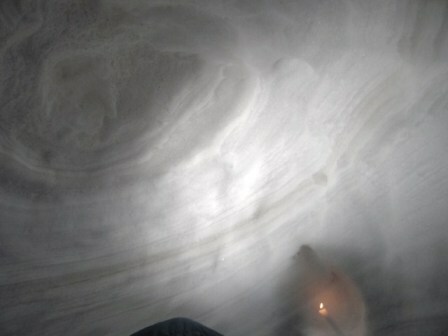 I drove to Labrador City in northeastern Canada where I dug a cave in a snow drift and camped inside. The temperature outside was -4º F (-20º C) but inside it was around 50º F (10º C) even without the candle. 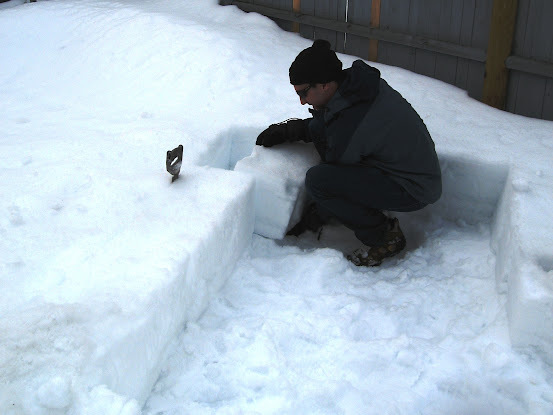 I have a snow saw now and I hope to go back sometime and build a proper igloo. 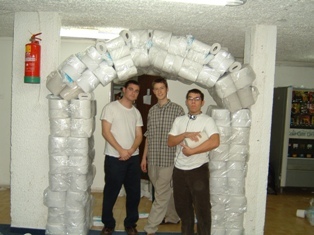 An arch built from packaged paper goods (Toilet Paper, Paper towels etc.) Built by Rueben and I after a couple tries. 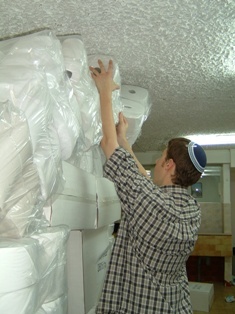 We had a huge delivery to the dorm. That many big rectangular blocks in one spot . . . they had to expect something built from it. The delivery included large cardboard boxes. 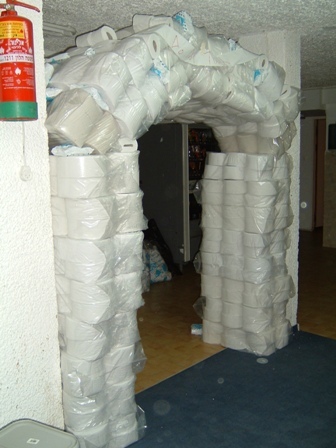 We supported the arch with the boxes until the keystone was in place. Some people have called it cheating to have used the vertical columns; the arch is not freestanding. In real life though, non-freestanding arches are very useful; for example bridging a canyon. The canyon walls would be in place of the columns. 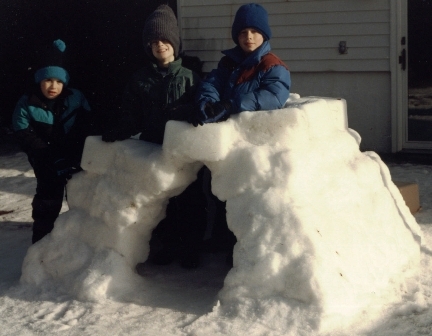 Igloos built from packed snow blocks by my brothers, some friends and I. Ample snow and a lack of school. My Mom taught my brothers and I how to do this. Simply pack snow into small plastic bins, empty it and you have a brick! 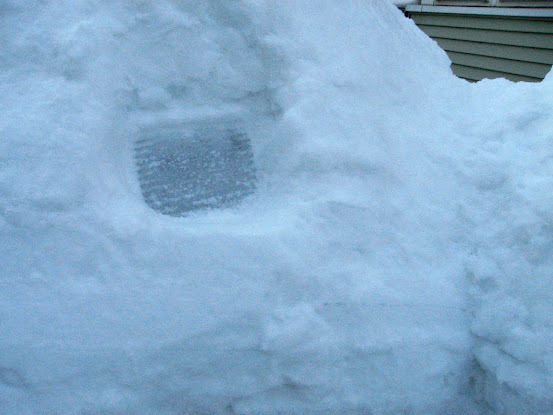 Do this many times with patience and you have an igloo! We've made five or six of them over the years. The first one we made without my moms help is shown being built at right (1993), it was pyramid shaped. 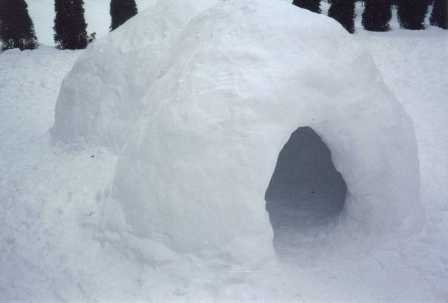 The other igloo (shown above) was the biggest. It had an electric outlet wired inside which was pretty neat. 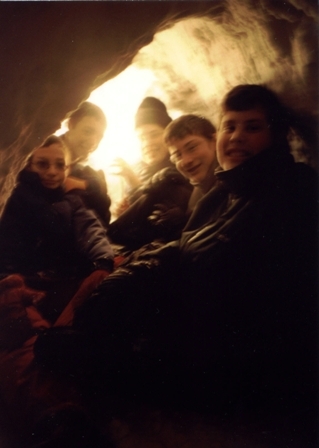 The picture at top right (lit by an electric lamp) shows five of the builders sitting comfortably in only the back half of the Igloo. I actually camped in it overnight and there was about two feet extra room from my head to the door.